January 27 is BerserkerDay 2011. That's the second anniversary of the founding of Wine Berserkers, which has quickly emerged as one of the world's leading places for wine discussion online and likely the top site located in the US. I wrote about the site a year ago as my wine story of the year in 2009, when Todd French finally had had enough of the overbearing editorial policies of a well-known and formerly public wine discussion site hosted by the Wine Advocate newsletter. After certain rabble-rousers, or truth-sayers depending on your perspective, were vilified with the term "berserkers" by one infamous forum moderator, the idea of a new discussion site revealed itself. One rooted in truly open discussion of wine and other topics, more open to industry participation and without the shadow of the world's leading wine review newsletter hanging over it. Let's just say criticism of the newsletter wasn't tolerated well in the old order. Wine Berserkers changed that. In two years, the site has naturally moderated from an anti-Wine Advocate site to something of its own skin, and there's been innovative. One of the more novel things to emerge has been Berserker Day, where the site anniversary is celebrated all day long with special offers for registered forum participants from many wine producers and other industry members who are also participants, including brewers and wine specialty retailers. The idea is to generate traffic for the site, but also to provide connections between the industry wine geeks and regular old geeks who all come to Berserkers as equals in geekery. It makes special sense because several of the industry types, such as myself, as only in the wine business because we were geeks who got to know others through the wine internet and gradually, or suddenly, fell into the business. For so long, that divide has been danced around by various discussion sites, with some successful bridging on sites like the West Coast Wine Network. But Wine Berserkers has taken the industry/wine lover connection to new levels, so that more producers seem to participate than any other site I know, in a way that connects the wine community more completely than I've ever seen before. All that said, if you register for Wine Berserkers (it's free), you can take advantage of the silly deals many producers offer on Berserker Day. Vincent Wine Company is participating, of course. And though I won't spoil the surprise, we're offering two different packages, both the best deals we've ever offered with one package offering an archive bottle that is simply unavailable to you any other way. Not sure when during the day the Vincent offer will go live, or how long it will last. So do what I'm going to do. Log in and check in throughout the day. Should be real good. Remember, you must register for the site to see and participate in the BerserkerDay deals. Hope to see you there. January 22 is the feast of St. Vincent of Saragossa, the patron saint of the vigneron and adopted patron of Burgundians. I named my winery Vincent not only because it's my name and my uncle and grandfather's, nor because "vin" in is the name. No, with a focus on Pinot noir and many things Burgundian here in Oregon, I thought it made sense to reference our historic patron, St. Vincent. Because it would be a little too self-referential to drink my own wine to mark the occassion, I thought it appropriate to open a bottle of Burgundy. 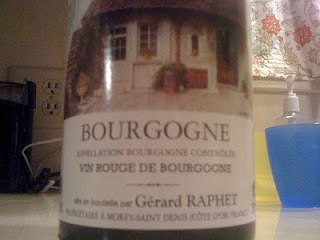 Specifically, the 2005 Gerard Raphet Bourgogne, with no importer's label and, under the foil capsule, a nice bit of cellar gunk. 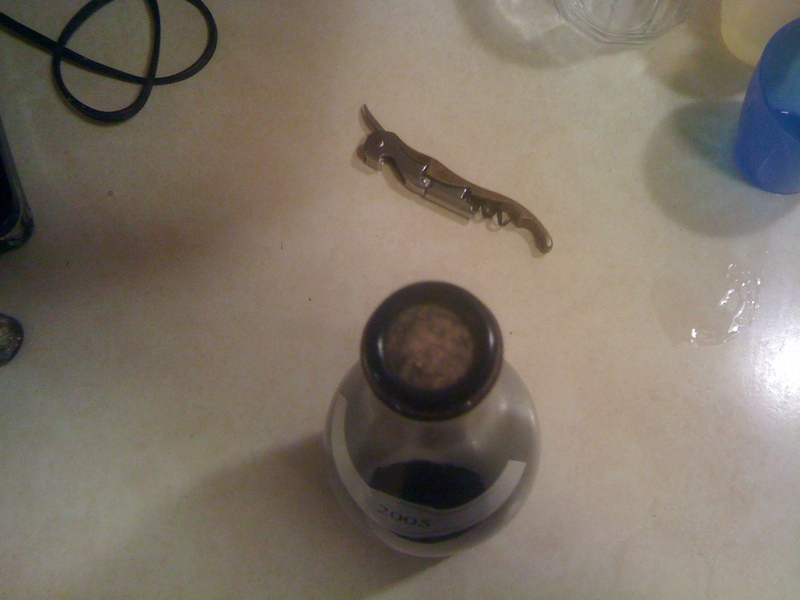 You might think the wine had leaked, causing mold to grow on the cork. No, this is clearly wine that was bottled without a label or capsule and left to age in the producer's cellar until it was sold, then cleaned off, mostly, and labeled and capsuled. When I pulled the cork, sure enough, there was no sign of leakage. Instead, the gunk is evidence of old school production methods. The wine followed suit. Even from a ripe year like 2005, this wine was translucent ruby in color with clean, crisp red fruit aromas. The flavors were similarly light and bright, perhaps a little too cranberry for casual sipping but nicely lively and richer with a simple mushroom and egg noodle pasta, not unlike a simple nebbiolo (which might have been a more classic match). In sum, a simple but honest way to mark the feast of my namesake. Am thinking I might have to throw a bigger bash in future years to celebrate the day. My own Fete de St. Vincent. Interested? Ignore if you're completely bored by winemaking details, or if you want to complain about my sloppy process with paper chromatography. Here's a picture of the progress of malolactic fermentation in the barrels of 2010 Vincent Pinot Noir. That's where sharp malic acid in young wine is converted by good bacteria to smoother lactic acid, a key part of the elevage or maturation of wine in barrel. As soon as "ML" is done, most people add some sulfur dioxide to help keep the wine smelling and tasting fresh until bottling. So it's important to monitor the progress. You don't want to add sulfur too early, and you don't want to wait too long to add it once the process is complete. What does this picture tell us? At the bottom there are markings where drops of wine from each individual barrel or tank were dried on the paper. 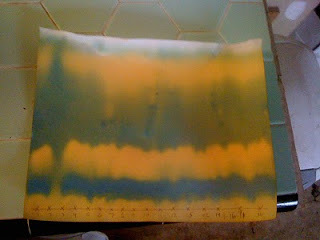 Then the paper was rolled up and soaked for several hours in developing solution, much like one would do with camera film. Then you let the paper dry or develop and here's what we see. The lowest strip of yellow is where the wine drops where. The next strip is strong evidence of tartaric acid, the primary acid of any grape wine. Then next portion up is where malic acid shows up. Mostly, it looks like ML is pretty much done, maybe not barrel 6, and a few others show some faint traces of malic acid. Then at the top the yellow strip shows lactic acidity. That shows up strongly in every barrel (there is no barrel number 2, so that's why that column doesn't show much of anything). At the start, there was no lactic acid, only tartaric and malic. So things look pretty complete. The next step is to test the lagging barrels again, or perhaps test them at a commercial lab for precise levels of malic acidity. Once everything is definitely done, in goes some sulfur and the wines rest for several months to settle out and continue to evolve. And thankfully, because wines in barrel in the middle of ML taste weird. I'm ready to see what we really have with the 2010 vintage. Lots of promise, but like rockets when they used to go behind the moon, it's time to reconnect and see where things are. Remote is a word that tantalizes. The thought of being somewhere, we hope with someone, remote, whether actually far from civilization or more simply far from one's own civilized norm. Paris comes to mind, a city where foreigners can lose themselves and yet feel remote amid millions of other people. Many wines come from more typically remote places like western Australia or Argentina's Patagonia. Places where few people live or even visit. Yet for any of us, there are places synonymous with wine that can provide that remote feeling, whether we travel there in actuality or simply through a glass of wine. Oregon is surely one of those places. It's a wonderful place to lose yourself, even if you never leave your home to taste our wine. For me, remote is somewhere like Bandol on the Mediterranean coast of France. Not because the autoroute doesn't go right through it. Nor is it a place where few people live or visit. But where else would you want to take your love, to eat and drink and walk and wander? And perhaps other things, all with the aim of letting go and finding things you never knew you were looking for. Tonight that meant coming home from the winery, full of thoughts about winemaking details and wine business realities, all good things but wonderfully in need of something remote. 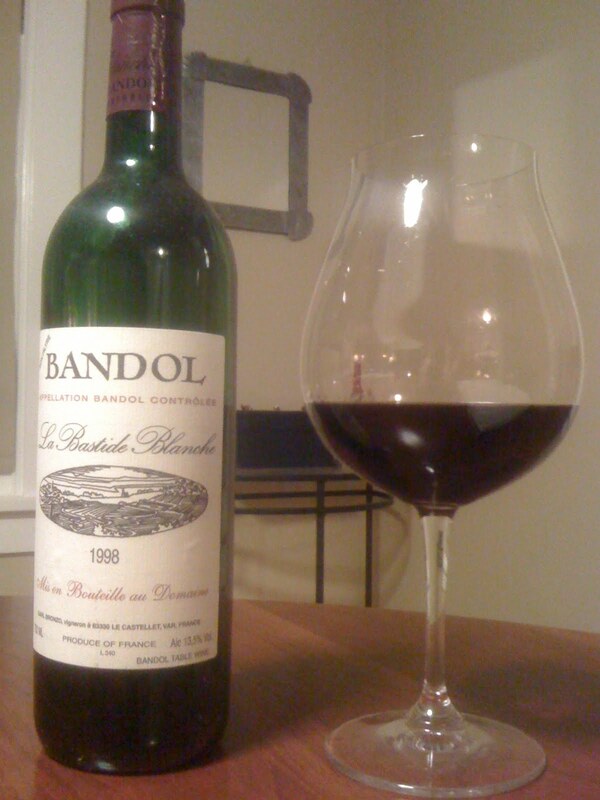 So I opened the 1998 La Bastide Blanche Bandol to match with steak, new potatoes and brussels sprouts braised with pearl onions and walnuts. Not a classic match, but when you need somewhere remote, you just go with it. The good wine, good food rule in action. The wine delivered. Imagine walking in the hills of southern France, uncannily familiar to me when I traveled there once and found scenes that reminded me of my native Santa Monica Mountains. The brushy herbs and dusty soil, mixed in wine with aromas of strawberries and meat. The fierce tannin of the mourvedre grape, tamed by the steak and nuts and potatoes on the dinner plate. Some sweetness of bottle age showing through, that impossible to describe scent and flavor like caramelization or torrefaction. Impossible like trying to capture and express the feeling of remote, that once in a lifetime feeling of something, some place, someone more special than you've ever known. Wine is hardly the only conduit to remote. But I like its ability to transport us to so many places, many of them holding the possibility of remote. The only thing to top it will be to actually travel there, with that someone, and let go. Occasionally we must document the various issues we face with certain bottles of wine. Usually when they happen in succession and wear us down, the only thing to do is blog in frustration. It began last night. We bought fresh rotini pasta and marinara, and while it's not a perfect match, I thought why not try the 1996 Ca Rome Barbaresco Maria di Brun. Picked two up at auction a while back, the first was oxidized and I was suspicious of this one. Looked fine, should have been fine, but wasn't. Damn. So we dial back for some "everyday" Barolo, which readers should remember well. The 2006 Reverdito Barolo that I wrote about last fall that was available locally for well under $20. Absurd pricing for real, even if entry-level Barolo. Wouldn't you know it. Corked. That unmistakable scent of mildew from improperly processed cork. That's where I draw the line. So out comes the 2005 Paolina Chianti Classico that we picked up dirt cheap when Whole Foods opened in our neighborhood a while back. Nothing fancy, but good honest Chianti with a little extra richness than usual. Perfect with the meal and obviously what I should have started with. Barolo and Barbaresco needs something more, though my rule with wine and food matching starts with wine you like with food you like. You don't need to get fancy with matching. So tonight we're making our version of enchiladas - vegetarian, with mushrooms and spinach. Meaning, it's not actual Mexican food and to be honest, not my favorite and certainly not something I look forward to on a weekend night. What's the right wine match for Mexican food? Beer. But I like slightly sweet white wines, and they do well with spicy food. So why not throw caution to the wind? I opened the 2005 Tessier Cour-Cheverny That's off-dry wine from the romorantin grape in a somewhat obscure appellation of France's Loire valley. I had this on release and it was delicious. Tonight, from a bottle that was already in the fridge, it smelled a little odd, tasted ok and then...bleeech. Sour yogurt. Clearly something biological in this bottle, turning a not quite right wine to something vile and immediately poured down the drain. Oh well. Pffft. Wait, what's that? Oh yes, the sweet, sweet sound of beer bottles being uncapped. Oregon's own Heater Allen brewing out of McMinnville. Isarweizen, for those who care. Clearly I should have known better and started here. Will remember for next time, no doubt. Jennifer made a simple wintry meal of porcini and crimini mushrooms sauteed in a little cream, mashed potatoes accented at the table with truffle salt, and pan fried fennel and carrots. Really, really delicious, and crying out for Pinot noir. So we opened the 2008 Seven of Hearts Pinot Noir Willamette Valley. I've written about this producer before, which has a tasting room in Carlton that you shouldn't miss. Seven of Hearts wines, their estate label Luminous Hills, and Honest Chocolates. All excellent stuff, the products of Byron and Dana Dooley. Great people, great stuff. A must stop in Carlton, which has quickly become the center of Yamhill county wine tourism, with several quality tasting rooms within a few block radius and some good food as well. This wine started out a little reticent. Dark colored but still translucent, the wine only revealed its perfume with some airtime in the glass. Fragrant, strong black cherry aromas, still delicate with floral hints and a little wood spice. Nice acidity, soft tannin but not overly polished. In short, classic 2008 Oregon Pinot noir. Ripe but still restrained, monolithic at first but opening with airtime and clearly showing the structure and flavor components to improve for a few years, at least. And this is their base level, least expensive bottling. 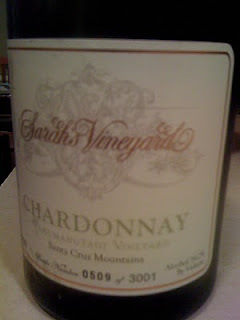 I've tried through all the '08s from this producer, and perhaps reported elsewhere on this blog. But trying this entry-level bottling on its own, wondering if perhaps it wouldn't be as good as I remembered...let me just say this is excellent. Find it, enjoy it now. Age it a little and enjoy it later as well. You can't go wrong. Nice work Dooleys. I've long heard about Cameron Winery's nebbiolo project, but never until recently did I see any bottled wine, much less have a taste. I'd heard of nebbiolo vines grown in the Clos de Bess section of the estate vineyard in the Dundee Hills, perhaps the only local planting (please correct me if that's wrong). I'd heard of pruning issues with the vines over the years, where apparently the first few buds on a cane aren't fruitful. Something you might know or learn if you lived in Italy's Piedmont and prune accordingly, meaning different than you might with pinot noir. I'd even seen a small barrel of nebbiolo wine in the Cameron cellar a few years ago on a visit, so I knew wine existed. I'd even heard of small amounts of bottled wine making it to a few local restaurants, but in this string of hearsay this is perhaps the most spurious. 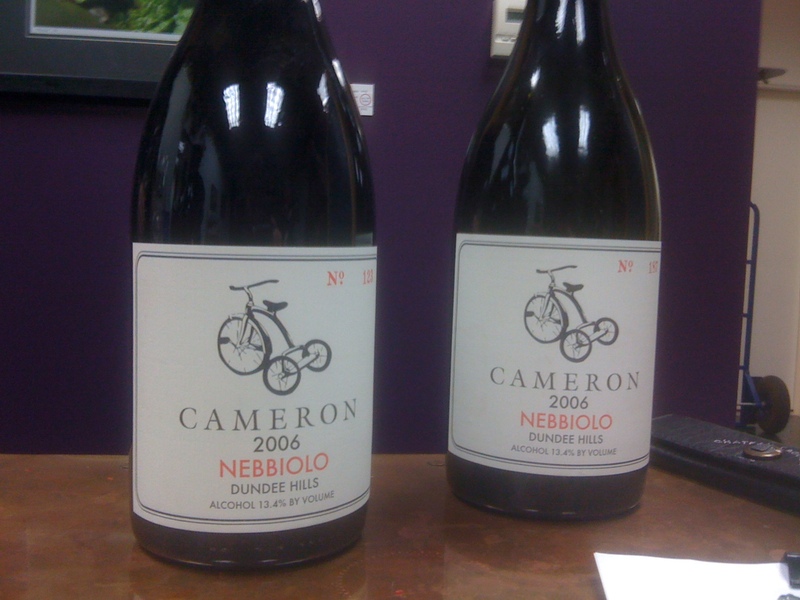 But it was only in December that I saw bottles, several in fact, of 2006 Cameron Nebbiolo Dundee Hills, a beautifully simple label that features a tricycle. The broader significance of that is a mystery to me, but suffice it to say I'm not going to sincerely flatter Tricycle Magazine (the Buhddist review!) with my own Tricycle label. Actually, Jennifer put the kibosh on that, but I saw this label and that's what I thought. I like the label. So how is the wine? Really, really good. This is like no domestic nebbiolo I've tried. We always want to compare things, but this isn't Barolo or Barbaresco. It's Oregon nebbiolo that's high toned and perfumed, rich in the mouth with signature nebbiolo tannin, nice length and savor that would be delicious to try over the course of an evening. Unfortunately, I only had a taste. There isn't much of this wine. It's precious, for sure. But even at the $50+ price tag it's very interesting and something worth trying at least. I sure would love to hear about other people growing nebbiolo locally. It's such a terrific grape and so unknown as a varietal here in the US. That should change. Tonight we sampled a little local riesling. 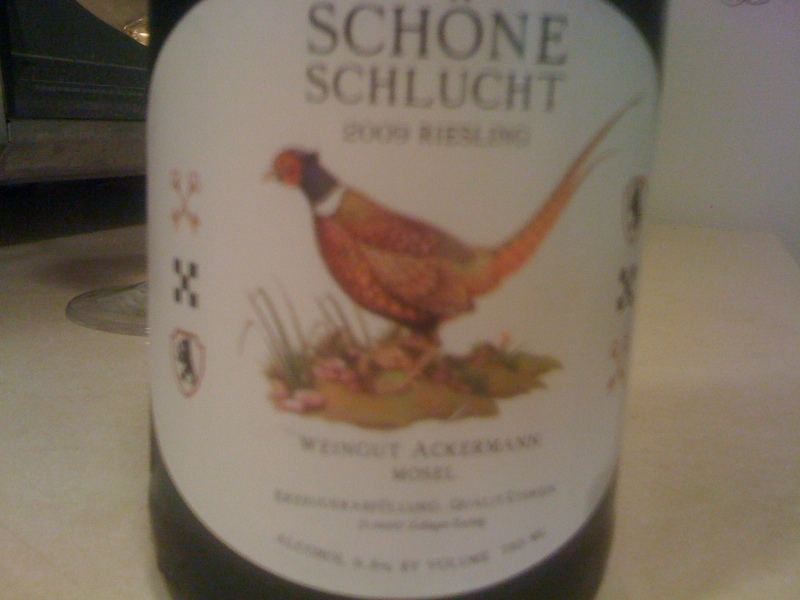 Actually, it was Weingut Ackerman Riesling from the Mosel river valley in Germany, imported and labeled by Portland's Schone Schlucht, producer of local "Teutonic" red and white wine. If you haven't tried the wines of Schone Schlucht, give them a go. Understand they are truly unique compared to standard Oregon fare. From their Alsea vineyard in the coast range to more typical grapes sources, the wines are distinctly crisp and bright across the board, nervy, mineral, perhaps challenging if you simply want to knock something back but full of life, delicious and memorable. And very Teutonic in style. When was the last time you saw domestic Riesling at something like 9% alcohol, sehr German? Who in Oregon labels a Pinot noir as Spatburgunder? I met Olga and Barnaby Tuttle, who grow rows of chardonnay in their NE Tillamook Street house in Portland, a while back and commented to Olga about how unique their wines are. She said yes, and that she wasn't sure at first but Barnaby was convinced of his vision for winemaking. Sure enough, there isn't anyone doing what they are doing, and the market seems to be responding well. It's a great story. But they don't just produce Oregon wine. There's this German companion to Schone Schulcht's more commonly available native wines, a special partnership with the terrific producer Weingut Ackerman. This 2009 Riesling is everything you could want in fresh, inexpensive German riesling, and something I'd love to see in more local riesling. 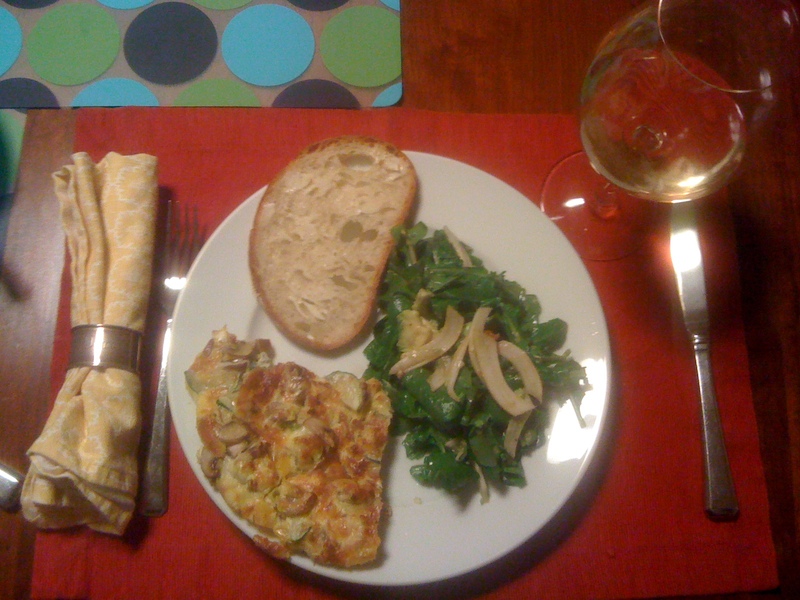 Light, fresh, peachy flavors with intense acidity but moderate sweetness that I think matched wonderfully with our dinner of vegetable and gruyere fritatta, arugula and fennel salad, and crusty bread. Jennifer thought it might have been a touch sweet, but I think it worked well with the mild saltiness in the food and the delicate textures. And at 9.5% alcohol, it's very reasonable to enjoy on a Tuesday night. I loved it. What a lovely New Year's Eve we had the other night. We were invited back to a celebration hosted by the owners of a local wine shop, who were most gracious to have us over last year for the first time. I was entranced then by one guest arriving with a pyramid of glazed profiteroles, or what I now know is a croquembouche. I was determined to bring a pyramid of my own, though made of something closer to my stomach. 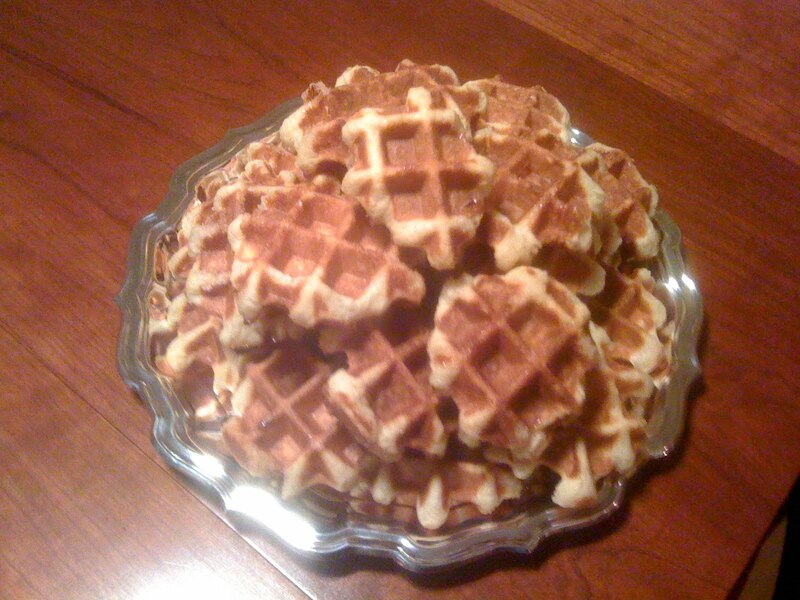 Why not Liege waffles, perhaps my favorite treat of all? These are Belgian sugar waffles made with yeast, eggs and chunks of pearl sugar, among the usual waffle ingredients, that make me dream of college days as a student in Europe. This is the ultimate street food for me, and though there's a "window" locally that makes a good version of these waffles, they're a little too American for my tastes. I spent all afternoon making several batches of waffles, in part to bring to friends kindly looking after our kids for the evening, in part to have enough to make a real pyramid. Wish the picture showed the height of the waffle platter. To me, these irregular waffles look as good as they taste. Sure enough, people audibly remarked when I brought in the plate. Unfortunately, most people didn't touch them until late in the evening, one person remarking that he thought maybe there was a sauce or something to go with them. No. The chunks of sugar melt during cooking, making the waffles essentially glazed from the inside. Toppings really just gild the lily here. If you're at all interested, I recommend this link for a good, authentic recipe. You're welcome. Of course, there were incredible wines to try at the party. NV Clouet Champagne Grande Reserve, full and rich, especially decadent from a 3L bottle. 1999 Cameron Chardonnay Abbey Ridge from the Dundee Hills of Oregon, showing a little wool and funk around the edges. I preferred the fresher, more clear but rich 2000 Cameron Clos Electrique Blanc, gorgeous Oregon white wine. Stunning really. There were Zind Humbrecht whites from the 1990s that I didn't get to, a magnum of 1999 Sauzet Puligny Montrachet from one premier cru vineyard or another that was typically austere and young for its age. Then a ton of reds, again many I never got to. Just had fun talking with old friends and new, eating a variety of delicious food and enjoying the fire on a cold Portland night. The 2008 Crowley Pinot Noir Entre Nous was excellent, as are all of Tyson's wines in 2008. He's a friend, but really, you should try these wines if you haven't. He's making some of the best stuff locally that I know of. I'm happy for him and his delightful wife Emily. I brought my two 2009s, the Vincent Eola-Amity Hills and the Zenith Vineyard. People seemed to like them, or at least not visibly look ill upon trying them. A win, no? I tried other things, the 1990 Produttori di Barbaresco Montefico Riserva, still young and not as giving as I would have guessed. The highlight had to be the 1978 Bouchard Musigny, more evolved than I expected and very good but not great. Still, Musigny on New Year's Eve. Hard to complain. In all, a nearly perfect night, one of those evenings where time slips away and you lose yourself in the moment, enjoying the atmosphere and the company, and just genuinely enjoy yourself. And by the end of the night, the waffle tray was nearly empty, meaning I had one last chance to take another for myself. Yeasty, rich, slightly crunchy from the sugar. Yes, nearly perfect. I can hardly have red meat and not pair it with some red wine. Tonight I'll test that because we have some steak but it's the end of a long holiday and a tall glass of sparkling water is probably the more prudent match. 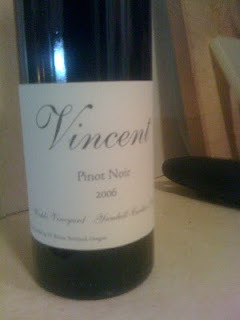 But the other night, with a small piece of beef alongside some pasta, why not pull out a half bottle of one of my homemade wines, the 2006 Vincent Pinot Noir Wahle Vineyard. Readers and garage tasters might recall this wine, made out in the garage, aged in a 5-year old French oak barrel from Domaine Drouhin, then bottled in early 2008. 2006 was a warm vintage and the grapes for this wine were pretty ripe, despite coming from deep-rooted old vines planted in the 1970s outside of the town of Yamhill. Older vines ripen more slowly and resist heat a bit better than shallow-rooted young vines. I was worried the grapes were too ripe to capture the subtlety of Pinot noir, and for a while the wine was indeed more fruity and rich than I like my Pinot. It's not shy but a few years in bottle, especially a smaller bottle that should age more quickly, have tamed the wild exuberance of youth. There is still a bowl of fruit in the aroma, but there is now some sous bois of age, just a hint of maturity that shows itself like a walk in a damp forest. With the simple meal, the wine was delicious, more nuanced than I remember and in a great place for drinking. People often ask me how long my wines will age. Who knows? But in general I prefer riper vintages on the younger side, so that a few years after bottling the wine should be at its best. 2006 and 2009 are good examples. Wines from cooler years are like less mature cut flowers, needing more time to open and release their perfume. 2008 and, likely, 2010 are examples. And wines from rainy harvests tend to need a little time to show their best, but may not have the density to last as long as the best years. 2007 might be an example, very generally speaking. I find that most 2007s were much better a year or two after release than right after bottling, yet contrary to some wine geeks' opinion, I haven't seen many wines that have the substance to reward longer term cellaring. The best may last and improve over time, but I think most are going to show their best now to a few years from now. So, too, with this generously ripe 2006. It tastes great, I'm happy with how it's turned out. I'm not going to wait too long on most of my remaining bottles. It's Dungeness crab season in the Pacific Northwest, one of my favorite aspects of the holidays is eating cracked Dungeness with a rich white wine. Perhaps steely but still rich white Burgundy, or roussanne from the northern Rhone. Or Oregon chardonnay. Or even...California chardonnay, provided it's from the right location. I don't want anything too sweet and overdone. But as much as I usually prefer racy, lithe white wines from all over the world, there seems to be a perfect match in a nice, rich chardonnay with the sweet meat of Dungeness crab. New Season's market had (perhaps still does?) a great special on fresh Dungeness, and coming back from Los Angeles the other day I quickly got back into the Oregon spirit by picking one out at the fish counter. In the fridge, a stray bottle of 2006 Sarah's Vineyard Chardonnay Vanumanutagi Vineyard, from California's Santa Cruz Mountains, the spread out, can't-get-there-from-here wine region south of San Francisco that is perhaps my favorite from my native Golden State. I remember Sarah's Vineyard wines from my early days as a wine geek in the early 1990s for their ostentatious labels and sky high prices. Who is this Sarah, I wondered. I never purchased, never tried the wines, and now many years later I came across a bottle and thought I should finally see what was inside. The estate has changed hands over the years and pricing seems almost unchanged from the old days, meaning what was crazy expensive is not simply mid-range for fine wine. Times being what they are, the bottle I found was on close out for next to nothing. Tough times in the wine business. The wine is golden in color, a large-sized chardonnay with toasty oak and hazelnut aromas along with ripe apple and pear scents. The balance is nice though, and the flavors are fresh and crisp despite the obvious ripeness, with a nice lingering finish. Sometimes this kind of wine is tasty for a few sips, then tiring. But I really enjoyed the mix of power and finesse here, and as I slowly picked my way through each crab leg and the wine warmed up, it really showed some mineral quality that makes the Santa Cruz Mountains a special region to me. There's something more here than just fruit and oak notes. Something that kept me coming back for more, that paired exceptionally with the crab. I'm trying not to OD on my crab habit, but it is New Year's Day today and what better thing could there be than to have more crab, another delicious white wine and watch some football with neighbors? Well, I can think of something, but this will be pretty nice. Happy New Year to you. Eat crab, drink a nice white wine. You'll thank me.